Homemade York Peppermint Patties – Make your own peppermint patties for your holiday treat packages this year and blow your kids and friends away! When I set out to create my holiday treat packages last year, I knew I wanted to make treats I’d never made before but that had been on my to-make list for a while. Like marshmallows. And homemade hot chocolate mix. 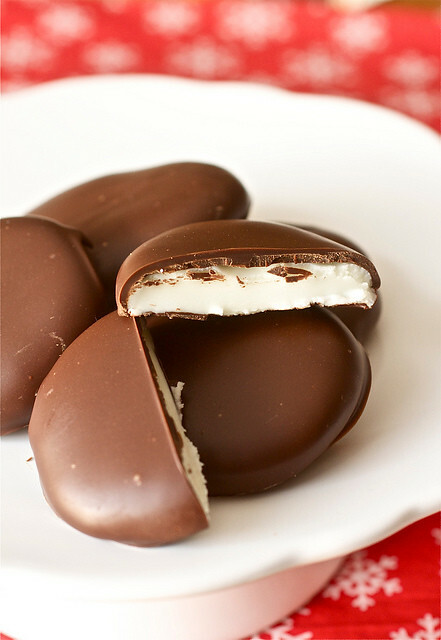 And these peppermint patties. Well let me tell you, these little peppermint candies made me the most proud I’ve been in the kitchen in quite a while. And they could not be more simple to make. The filling is SO easy to put together, but dipping them in chocolate will require some patience. You’ll need to dip them in batches and keep the extra little rounds of filling really cold (like frozen) while you dip because as soon as they start to come to room temperature, dipping them in warm chocolate is impossible. And impossibly messy. Trust me! The chocolate will harden around the mint patty so make sure all of the filling is covered by chocolate. Otherwise the patty filling will ooze out. But needless to say, my York peppermint patty connoisseur (Kyle) LOVED these and so did I! They are waaaay better than any store-bought version. And even though they require a little extra effort to make, you’ll find that the gushing people will do over these peppermint patties will be totally worth it. Although I haven’t tried it yet, I think these peppermint patties would be an incredibly fun holiday kids project. You can make your kitchen into a little assembly line with multiple stations for each part of the process. One for making the filling. One for rolling and patting the filling into patties. And one for dipping in the chocolate. Since there are a few steps here, everyone gets to help! And at the holidays, it’s ALLLL about keeping the peace, isn’t it? Make sure you freeze the filling patties before dipping them in the melted chocolate or they will start to melt and ooze all over the place. In the bowl of a stand mixer fitted with the paddle attachment, mix together the condensed milk, 2 cups of powdered sugar, and peppermint extract on medium speed until well incorporated. Add more powdered sugar, 1/2 cup at a time, until the dough is stiff but still pliable. You’ll need almost the full amount, but add it slowly, as directed. Roll the dough into ¾-inch balls (a small cookie scoop helps with portioning the dough) with lightly damp hands to prevent the dough from sticking to your hands. Flatten each ball into a disk about ¼-inch high and set the disks on the baking sheets. Transfer the baking sheets to the freezer for 30 minutes. While the dough is chilling, temper the chocolate coating. Remove one baking sheet from the freezer. Place a patty on the tines of the fork and dip in the chocolate until completely covered. Allow excess chocolate to drip off the patty before setting each one on top of another parchment paper lined baking sheet, platter, or plate. Slowly reheat the chocolate once it starts to becomes too thick for dipping. Move the chocolate-coated peppermint patties to the refrigerator to completely set up and harden. Remove more undipped patties from the freezer as you finish dipping others so that they are always very cold as you dip them. The peppermint patties are ready serve when they are dry to the touch.